Argenoves Pinales, a 25-year-old medical assistant and restaurant manager working two jobs is over the moon to become a US citizen. Now, he wants to vote Donald Trump out of office. 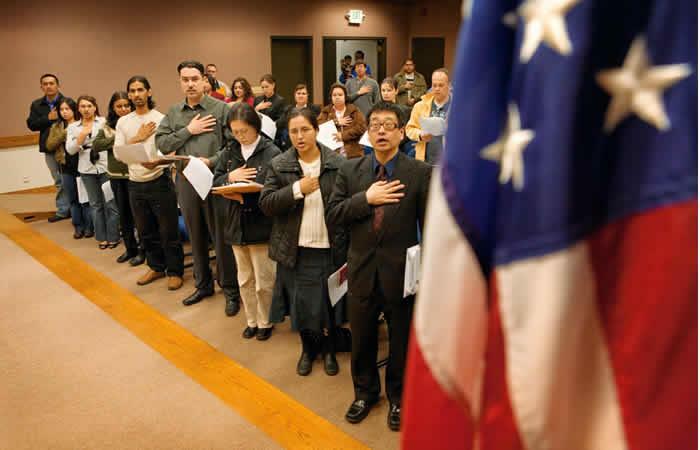 “I feel great,” he beams, one of 200 immigrants from 47 countries who pledged the oath of allegiance at a New York citizenship ceremony, and one of more than 14,000 being welcomed nationwide at dozens of events between June 28 and July 10 designed to celebrate Independence Day. He dreams of going back to college to study criminal justice and joining the police department. He was one of 86 migrants from the Dominican Republic at Tuesday’s ceremony, the largest single group and one of those countries experiencing a decline in US immigration visas. The number of people getting visas to move permanently to the United States is expected to fall 12 percent during Trump’s first two years in office, according to a Washington Post analysis of government data. “I became a citizen to vote,” says Pinales, looking ahead to 2020, the next time that Americans can elect a president. “He’s not going to be there!” he says of Trump. The Supreme Court last week upheld the US president’s travel ban, restricting arrivals from the mostly Muslim countries of Iran, Libya, Somalia, Syria and Yemen, as well as North Korea. The number of new arrivals from those Muslim-majority countries are heading toward an 81 percent drop by September 30, according to the Washington Post. Of those countries, only Yemen was represented at the ceremony, and by only one new citizen. The number of immigrant visas granted to people from Afghanistan, Bangladesh, China, the Dominican Republic, Haiti, India, Jamaica, Mexico, Pakistan, the Philippines and Vietnam had also declined, the Washington Post analysis found. At Tuesday’s ceremony, in the illustrious Beaux-Arts New York Public Library building on Fifth Avenue, a taped message of welcome from Trump was greeted with warm applause. “God Bless the USA” was played. Young, old, people of all colors and backgrounds were united in one purpose — cheering in delight and many waving tiny US flags. The more gregarious posed thumbs up or blew a kiss to excited friends and relatives in the audience while collecting their certificates.